Das Island Fire & Rescue Service Dennis DF131 Foam/Water/Emergency Tender. Foam Injection System - 297 lpm. Skum Monitor discharge - 1600 lpm. Range +/- 45m. Due to be replaced in 2011. 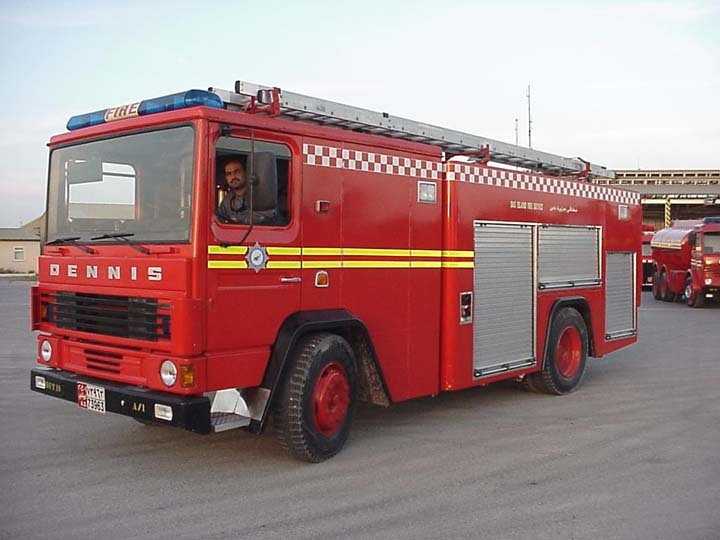 Thanks for sending the pictures in from Das Island Graeme, its been a pleasure seeing some real classic old Dennis appliances. I think this photograph of the combination emergency tender is really brilliant, they all look so new having been treated so well....Thanks. Added by Pete Matten on 18 February 2009. Unique cab design it seems like they convert the second crew door into compartment to store equipment. Also note the driver drives at the left side, rare to see Dennis in left hand drive. Thankyou Graham, I have really enjoyed this set of pictures, Dennis heaven and warm weather! Added by John Stott on 19 February 2009. Graham - is the fire brigade on DAS still operated by BP, or is there municipal input now ? Added by Graeme Beglin on 11 March 2009.